Today I want to share with you the Core SKILLZ (7 9-year olds) curriculum breakdown. Seven to nine-year-olds are what most people consider "the golden age." They are proficient in their vocabulary and problem-solving skills, yet they are not at the age where they want complete independence from adults. This makes the teacher-student relationship stronger than ever. The problem we discovered is they still lack core skills, and although they are highly intelligent, they struggle to keep up with students ages 10 and up. The solution we found is to provide them with their own program which targets their stage of development in a manner that adapts to their adventurous attitude and youthful nature while at the same time building skills which set them up for success. With that said a structured program introducing core skill-based training in Martial Arts has proven to be very successful. AGILITY - this skill helps students improve their footwork, kicking skills, and body control. TECHNIQUE - this skill helps students develop fine motor skills in their feet and hands. COURAGE - this skill helps students develop the confidence to defend themselves as well as the ability to lead others. FLEXIBILITY - this skill helps students develop a better range of motion in their legs, core, and upper body. INTENSITY - this skill helps students increase their focus and power. PERSEVERANCE - this skill helps students improve their ability to not give up physically, intellectually, emotionally, or socially while under pressure. SPEED - this skill helps students improve their technical, explosive, and reactive speed abilities. CONCENTRATION - this skill helps students improve their ability to remain focused despite challenges or distractions. 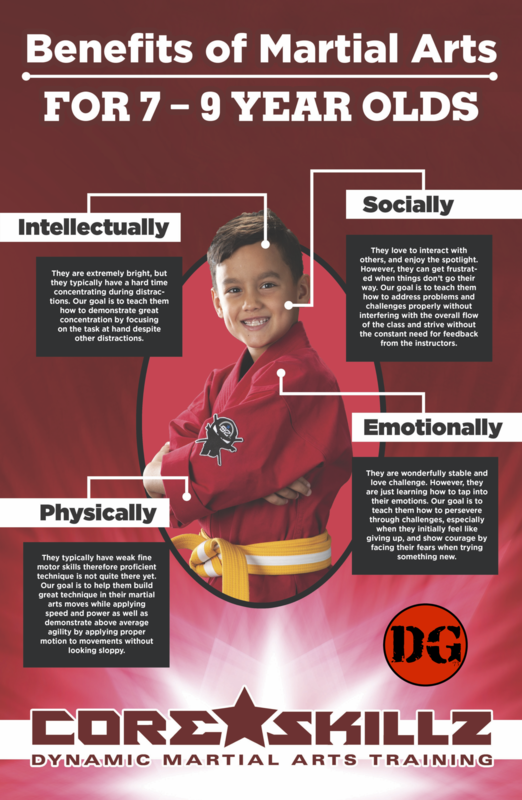 I hope you enjoyed this content, my goal is help demonstrate that the martial arts programs at Dragon Gym are more than just kicking and punching. However, saying that is just a cliche, but I hope to give a conceptual summary of our pedagogy.